Australia’s richest person Gina Rinehart is pushing ahead with defamation action against Nine Entertainment, claiming the TV network knowingly aired 20 “glaring errors” in its drama House of Hancock. Mrs Rinehart is seeking damages, saying Nine not only defamed her but committed the tort of injurious or malicious falsehood, outlined in an amended summons filed last week. Scenes from the two-part series including Mrs Rinehart confronting her father Lang Hancock while he was in hospital in 1992, are among the “falsehoods” that Mrs Rinehart’s legal team said Nine was aware of “from its archives and from more recent correspondence”. 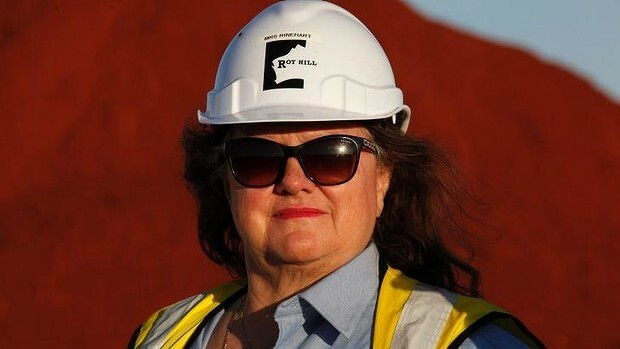 “To portray Mrs Rinehart in this way is entirely inconsistent with the reality,” Mrs Rinehart’s solicitor, Mark Wilks, said. Mrs Rinehart officially took over Hancock Prospecting after her father died in March 1992 and later became Australia’s richest person, with her wealth estimated at $20 billion. She launched the legal action against Nine in the NSW Supreme Court last month after the first of the two-part miniseries aired. Mrs Rinehart won an advanced screening of the finale before its broadcast and identified a list of errors. Nine made several edits, which are the subject of a confidentiality order, but her solicitor said 20 “falsehoods” remained. Mr Wilks said although Nine inserted a disclaimer into House of Hancock, saying that certain scenes were fictionalised, the series “remains devoid of factual accuracy and is almost entirely fiction”. “What was not entirely fictitious was twisted so as to be incorrect,” he said in a statement. “As a show it has denigrated the memory of Mrs Rinehart’s late parents and husband and wrongly portrayed that it accurately depicted those family members. While the court action is focused on the show’s broadcast, it is understood Mrs Rinehart’s legal team are concerned the series’ DVD, which will be available later this month, will include the cuts Nine made after her advanced screening. But Nine is adamant the DVD will include normal behind the scenes footage and not what it cut from the program following Mrs Rinehart’s viewing. Nine declined to comment on the legal proceedings on Monday, as did production company CordelljigsawZapruder. Mrs Rinehart hasn’t taken action against CjZ.